There has been a lot of conversation on the AU Passport and what it has to offer Africans after its launch in Kigali in June. And for the African development practitioners – this is a huge step in the right direction. For the normal person that doesn’t see what the practitioners see – it is not being seen as an achievement at all. I happen to be on both sides. And so at this point I have mixed feelings. We have lobbied for free movement on the continent and so the passport is definitely a start. But – I think that we still have issues that we need to solve before this is widely implemented. End of last month –I traveled to Banjul, The Gambia. I left Kampala – took a 70 minute drive to Entebbe International Airport. My first flight was at 8:20 pm, 45 minutes to Nairobi. As usual Kenya Airways was delayed. So I arrived in Nairobi well after 9:00 pm. I had to stay the night in Nairobi- which I was so thankful for because the journey the next day was one that I was not entirely looking forward too. My only consolation is that I was visiting The Gambia for the first time. There is always that excitement when you buy a new pair of shoes and want to sleep in them – that is what visiting a new country feels like for me. Nairobi to Leopold Senghor International Airport, Dakar flight was at 7: 00 am EAT. The flight would make one stop over in Abidjan where passengers would drop off and more would get onto the plane. This is typical standard procedure for most of the flights within Africa. I got to Dakar and went through Immigration, picked up my bags and went to the departures terminal to check in for my 25 minute flight to Banjul with SN Brussles. Air Maroc, Arik Air and SN Brussles are the only international carriers that go to Banjul and so the options on flights are limited. I arrived in Banjul at about 6:30pm GMT – almost 30 hours after I set off from Kampala. 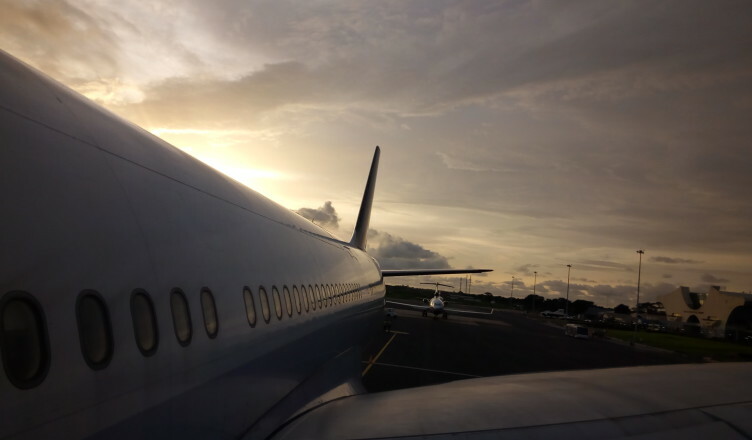 The return journey was just about the same – this time with a 24 hour layover in Dakar, Senegal before 10+ hours in flight with 2 stopovers before getting to Uganda. Now, you will understand if after such a trip I don’t want to say a word to anyone for days. Rest is paramount. This is what I don’t see the Africa Passport solving – AT ALL! Easy movement on the continent is not something that is going to be solved by a Passport. The cost itself for that trip was over $1500 – the same that I would need to go to another continent and back. And my other colleague failed to get onto his flight because he needed a transit visa or a Letter of Embarkation from the Gambian government authorities addressed to Arik Air in Johannesburg- which he would present at check in. He had an invite letter and a ticket – and wasn’t going to leave the airport. But rules exist to be followed. If he were to get the letter within minutes of flight cancellation – the next flight that would get him to Banjul from Johannesburg would get him there in 3 days. The day of travel was a Saturday. Start of the journey would be the next day but he wouldn’t get to Banjul until Tuesday afternoon! Open skies will only be effected if we are able to take care of the finer details first. The two priorities for me being: Visas and Trade. [Visas is another story for another day] We need to open up our markets to each other. Currently we seem to have the Regional Economic Communities thriving on their own. I have seen Kenyan tea in Shoprite Malawi, Shoprite is however a South African brand. This means that Malawi is benefiting both from COMESA and from SADC. But we can do more – I would like to see a direct flight to Lilongwe or Windhoek without having to first go through Addis Ababa, Nairobi or Johannesburg. Or better still, if I have to make the stopovers – let the ticket not cost an arm and a leg and let there be at least 3 different times and flights to choose from. I believe that once we are open to trade among-st ourselves, there will be reason to travel frequently. Our supermarkets are full of goods from the Gulf Region and China – because it is cheaper to get those here than it is to get goods from within. The passport will not take care of these issues – but it will go a long way in ensuring that its holders are treated with dignity at the different border posts where it is presented. It is not yet open to the rest of the public – so we don’t know how a normal ‘kawaida’ person like I will get treated while using the passport. The Afro – optimist in me though believes that we are charting our way to unity our way and for me that is important. I am positive that we shall get there. None the less – The Gambia is a beautiful country despite the tedious journey getting there and I would definitely love to visit there again.